The 2018 non-waiver trade deadline is now six days away and the Yankees made their (first?) big move last night. They acquired Zach Britton for three pitching prospects. The trade became official late last night. No need to worry about those stingy O’s medical reviews. It’s done. Britton is a Yankee. Anyway, here are the latest deadline rumors. The Yankees had two scouts on hand for Chris Archer’s most recent start and they have asked about his availability, report Pete Caldera and Jerry Crasnick. Archer faced the Marlins on Sunday and it was the perfect encapsulation of Chris Archer. 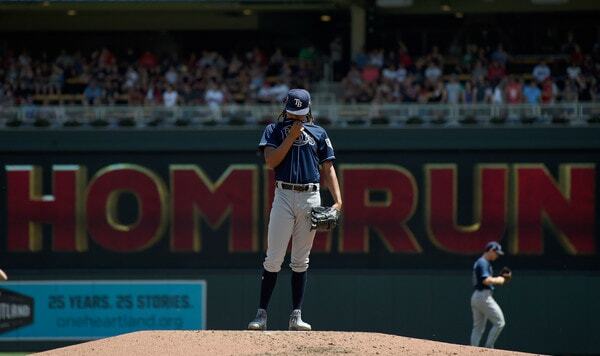 He struck out 13 and walked zero in six innings … and also allowed four runs on eight hits. Archer has a 4.30 ERA (3.50 FIP) with 25.6% strikeouts and 7.5% walks in 90 innings around an abdominal injury this year. Since Opening Day 2016, he has a 4.09 ERA (99 ERA+) in 492.1 innings. Truth be told, the Rays missed their opportunity to trade Archer for maximum value a few years ago. He turns 30 in September (no, really), his performance has slipped in recent years, and he comes with three years of control beyond 2018 rather than four or five. That said, Archer can still tantalize with his stuff, and three years of control at $27.7M from 2019-21 is a great price even if he is a true talent league average starter now. The Yankees are doing their due diligence. I still get the sense Tampa will want an ace-caliber package in return for Archer though. According to Joel Sherman and Andy Martino, the Blue Jays are really pushing to trade their rentals soon — they don’t want to be stuck trying to move everyone on deadline day — and their asking price for J.A. Happ has dropped. They had been seeking a club’s top three-ish prospect in return. The Scott Kazmir trade makes sense to me as a benchmark. Kazmir went from the Athletics to the Astros for two mid-range prospects (Daniel Mengden and Jacob Nottingham) as a rental three years ago. The Yankees have of course been connected to Happ in recent weeks, so this information is relevant to them. Maybe this’ll start to move things toward the finish line. Happ has a 4.18 ERA (3.84 FIP) in 20 starts and 114 innings this season, though his last six starts have been rough (27 runs in 31.1 innings). Even last time out, he needed 102 pitches to throw five innings of one-run ball against the Manny Machado-less Orioles. Thing is, all the other rentals (Cole Hamels, Tyson Ross, etc.) have stunk recently too. I liked Happ the most among the rentals to start with. Since they’re all struggling, might as well stick with the guy liked most in the first place? I guess? According to our Sung-Min Kim, the Yankees have been pushing Clint Frazier in trade talks in recent weeks, but teams are showing more interest in their pitching prospects. The Yankees are loaded with outfielders and pushing Frazier in trade conversations only makes sense. His recent disabled list stint and trip through the concussion protocol really complicates things before the trade deadline, however. As for trading pitching prospects, man, trade ’em all. Well, no, not all of them, but I think you know what I mean. The Yankees are loaded with pitching prospects — 22 of MLB.com’s top 30 Yankees prospects are pitchers — and the attrition rate is so damn high. Trade some of them before they blow out their arms and whatnot. Justus Sheffield is on another level for me. He’s a stud and he’s so very close to MLB ready. He should only go in a trade for a true difference maker. Chance Adams? Albert Abreu? Pretty much every other pitching prospect in the system? No trouble trading any of them. In some very unsurprising news, Jack Curry reports the Yankees won’t trade any of their top prospects for a rental before the deadline. Maybe in a better trade market they would, but, with no high-end pitching rentals available, the top prospects are staying. Curry lists Sheffield, Frazier, and Estevan Florial among the “untouchable for a rental” group, which makes sense. The Yankees did trade three prospects for Britton but only one (Tate) ranked among my most recent top 30 Yankees prospects. He was No. 7. (To be fair, Cody Carroll was No. 31.) The farm system isn’t what it was 18 months ago due to trades and graduations, but the Yankees still have plenty of good trade chips down there, even with Tate gone and the top guys off-limits. There’s an awful lot of pitching down there to peddle. As expected, the Yankees have been pushing Brandon Drury and their various Rule 5 Draft eligible pitching prospects (Adams, Erik Swanson, etc.) in trades, according to Sherman and Martino. Drury and either Adams or Abreu, who is already on the 40-man roster, reportedly made up the bulk of their offer for Manny Machado. The Orioles wanted Florial and that was that. I should note the Yankees agreed to trade three Rule 5 Draft eligible arms (Carroll, Tate, Josh Rogers) for Britton. As for Drury, Jeff Passan says the Yankees have been pushing him in trades for controllable relievers (in addition to the Machado), and Jon Heyman adds Drury was in the team’s offer for Brad Hand. I assume the Britton trade ends the bullpen search, but who knows? They could add a long-term bullpen piece to help win this year and help replace impending free agents Britton and David Robertson after the season. Could happen! But yeah, I wouldn’t count on it. Point is, the Yankees are pushing Drury and Rule 5 Draft eligible pitchers. Here’s a list of their upcoming Rule 5 Draft eligibles.